Free goodie bags with every crochet and needle felting course! To celebrate my first 'Atelier' birthday I'm giving away goodie bags with every needle felting and crochet course booked for the rest of the year! 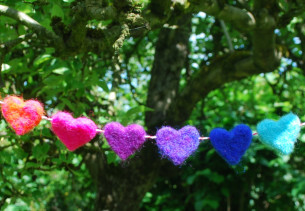 An Atelier Needle Felting workshop is all about colourful, instant gratification! I show you the techniques, surround you with inspiration and provide you with an abundance of beautiful felting wool. Together we explore the possibilities over home made cake and at the end of it all you get to leave with a goodie bag that has everything you need to carry on creating and includes an assortment of deliciously colourful wool. I guarantee you will LOVE what you make. Book onto any crochet course, including a masterclass and you will receive a goody bag containing an assortment of wool and a hook to keep you going after your lesson (dog not included!). It takes me just 2 hours to get you crocheting a granny square with confidence…..and that’s a promise! Once you've been on a crochet workshop you can have a refresher session completely free of charge. I run these every month and they are open to all.